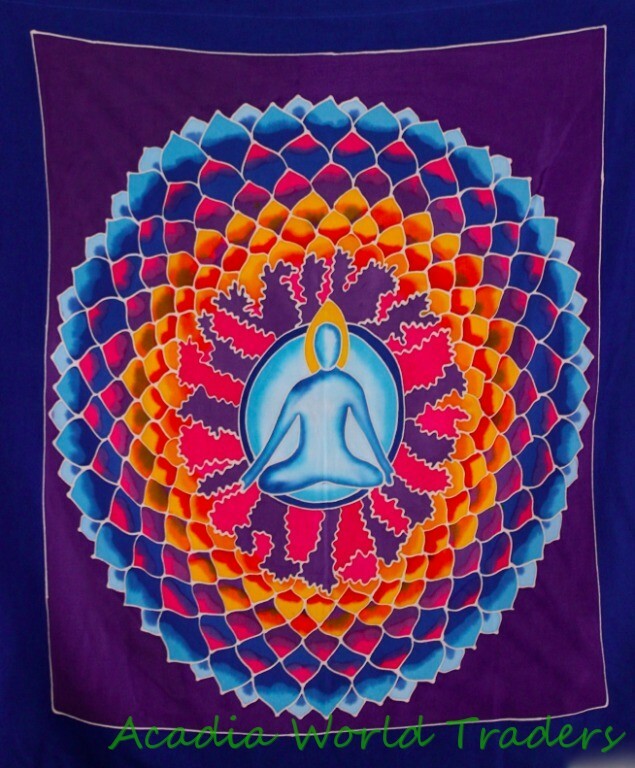 Our gorgeous Beautiful Hand Batik Mandala Goddess Prayer Flag, wall banner is all completely hand crafted on the Island of Bali. Each flag is painstakingly hand batik-ed by a group of Balinese Ladies in the Ubud Area. Ubud is famous for this type of batik painting. The wax is drawn on to each hanging in the desired design. The colors are then brushed on by hand with simple bamboo brushes , and blended. The wax forms a block and prevents the colors from bleeding into one another. When they are done applying the colors, the dyes are set, and the wax is removed. And the amazing fabrics are laid out in the rice fields to dry. This results in a beautiful depth of color you would never find in a mass produced machine printed fabric. Enhance meditation and healing body work and energy. Beautifully hand batik colorful mandala wall art with rod pocket at the top for hanging. We use only 100% high quality rayon. These great flags would be equally as beautiful inside your home or in the garden. Perfect for Yoga studios, spas or retreats too!